"The Native Americans would use various ways of markig trails, some as subtle as bent grass, a few stones piled together, or broken tree branches, but some more obvious. In this painting, a length of red trade cloth has been tied to the branch of a willow growing along the bank of the Snake River in what is now Teton National Park in Wyoming. Two Crow warriors have discovered it and will have to hudge what meaning it has." Taken from the catalogue of the 2004 Prix de West Invitational Exhibit. 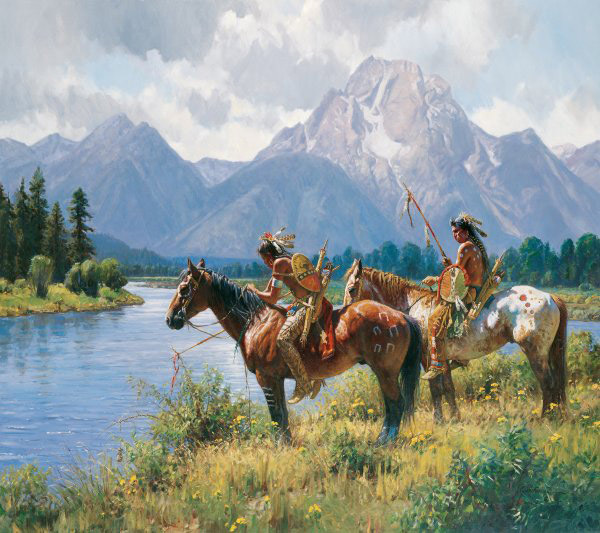 This breathtaking painting won the award for being chosen as the most popular painting at the 2004 Prix de West.